A security researcher says he was offered $20,000 a month to help the UAE government spy on the public. Kamran Jebreili/AP/Press Association Images. 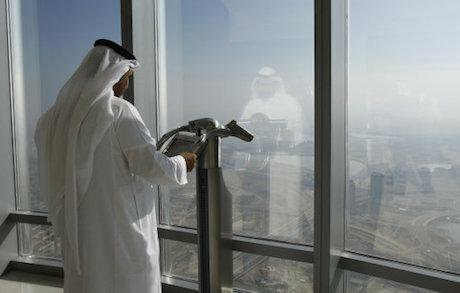 All rights reserved.The United Arab Emirates is recruiting an international team of computer experts to develop a far-reaching surveillance state covering Abu Dhabi and Dubai, Middle East Eye (MEE) can reveal. Margaritelli was initially contacted on 3 July by an Italian employee of Verint Systems, a security company in New York that bases half of its 2,800 staff in Israel. He was told in an email, seen by MEE, that the UAE was building “a research and development unit that will constitute their most advanced branch of cyber security, to the exclusive benefit of the [UAE’s] national security”. On 20 July, Margaritelli travelled to Dubai, where he learnt more about the UAE’s goal of “creating an elite task force to research and develop new large-scale surveillance solutions”. Sitting on the 29 floor of the Marina Plaza in Dubai’s upscale marina, Margaritelli said he was told that the UAE was developing a surveillance system “capable of intercepting, modifying, and diverting (as well as occasionally obscuring) traffic on IP, 2G, 3G, and 4G networks”. Margaritelli said he was informed that the “big boss” behind the project was Faisal al-Bannai, an Emirati businessman who is the chief executive officer of UAE security company Dark Matter. Dark Matter describes itself as a “trusted partner” of the UAE government. On its website the company says it is “the only company in the region and one of an elite few globally that covers the vast spectrum of cyber security needs”. Margaritelli told MEE he was offered a monthly tax-free salary of $15,000 along with an apartment and bonuses if he joined and that the offer was raised to $20,000 a month after he initially rejected it. “They probably would have raised it even more,” he said. Margaritelli confirmed that the Falcon Eye surveillance system, which was recently announced by Abu Dhabi authorities, means the UAE has “hardware probes all over the country”. Margaritelli’s Italian contact at Verint System told him that the probe network meant that, with the appropriate software, Emirati authorities could spy on the communications of anyone in Abu Dhabi or Dubai. The New York Times recently reported that the UAE bought a number of surveillance products from companies including Italian firm Hacking Team. But Margaritelli said the significance of his job offer was that the Emirati government was now seeking to develop its own system and not just buy standalone products. Margaritelli said local companies in the UAE had agreed to cooperate with the government’s surveillance plans and that the probes were being put “everywhere”, including in shopping centres and airports in Abu Dhabi and Dubai. “They just need a scalable software to put on them,” Margaritelli said, for the mass surveillance system to become operational. Margaritelli said the UAE was trying to recruit “young IT security talents by promising large sums of money … various bonuses, apartments, and most of all, by presenting a professionally and intellectually stimulating environment”. He added that if any concerns were raised by those working on the project, they would be told about “the necessary compromises when it comes to national security”. News of the UAE’s latest moves in advancing their already highly sophisticated surveillance capacity comes after MEE revealed last year that the company charged with installing the Falcon Eye system was owned by Israeli businessman Mati Kochavi. Israeli involvement in the UAE’s surveillance system is part of a burgeoning relationship between the two countries, despite there being no official diplomatic relations. Israel’s Channel 2 reported in January that the Israeli foreign ministry was interested in opening an office in Abu Dhabi. It followed the December 2015 announcement that Israel was opening a public office in the UAE at the Abu Dhabi headquarters of the International Renewable Energy Agency. A spokesperson for human rights group Privacy International told MEE that the UAE’s surveillance plans are “absolutely frightening”. Omanovic added the UAE’s alleged poor human rights record should raise concerns about their plans for far-reaching surveillance in the Gulf state. The UAE has regularly been accused of imprisoning and torturing peaceful critics of the state, allegations strongly denied by the Emirati authorities. None of the companies mentioned in this article or the UAE government responded to repeated requests for comment. This article was first published on Middle East Eye on 1 August 2016.